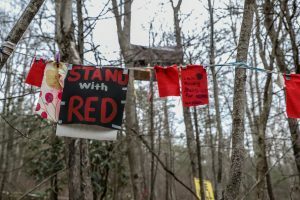 As tensions over Dominion Energy’s pipeline projects increase across the state, embittered landowners along the Mountain Valley Pipeline (MVP) path have turned their efforts towards occupation movements. 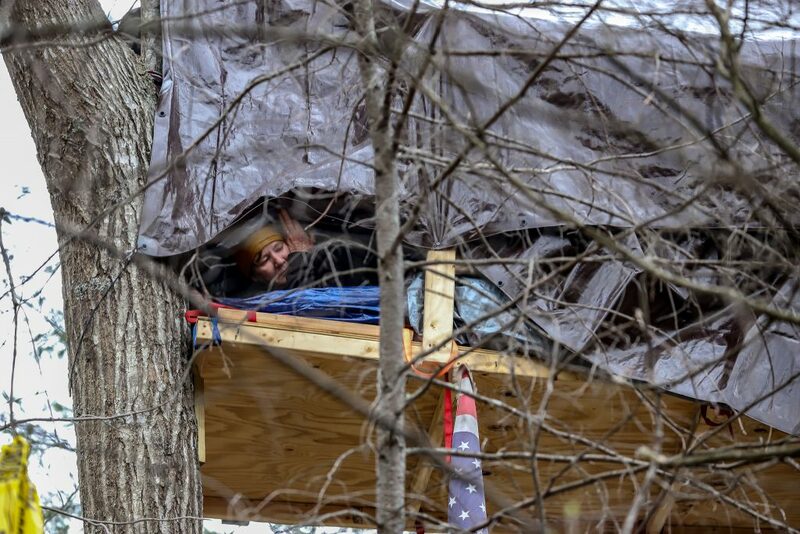 Theresa “Red” Terry, 61, and daughter Theresa Minor Terry, 30, have been living in treehouse platforms in the woods on their own property since April 2. 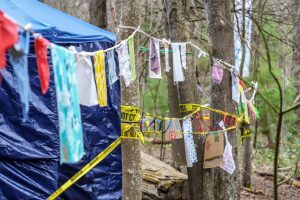 The Terry property, situated on Bent Mountain, has been in the family for seven generations. 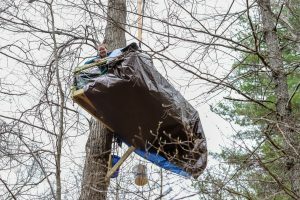 Other tree sitters have begun to join their movement throughout the area, such as those who are perched in the woods on Carolyn Reilly’s property, just 30 minutes away. 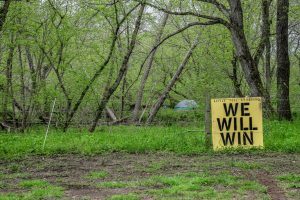 Reilly and the Terrys are now being held in contempt of court, while the Terrys have been charged with three misdemeanors by the state, including impeding work and trespassing. 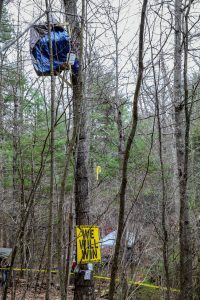 Both Red and Minor Terry are living on separate tree platforms in two different locations, both near streams running through their property. 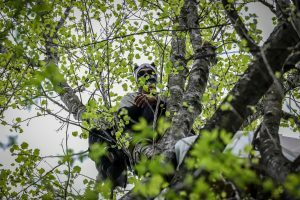 MVP claims their protest has halted work to cut trees, but the Virginia Department of Environmental Quality (DEQ) has forbidden MVP to cut trees within 75 feet of any waterway for the season due to the Roanoke logperch spawning season, a local fish protected by the state. 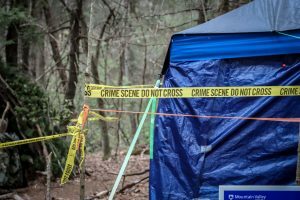 “If I weren’t here, they would cut anyway,” Minor Terry said, whose tree perch is described by state law enforcement as an ‘active crime scene.’ Both state police and Global Security, a private security company hired by MVP, share a tent while camping outside Red and Minor’s tree sits. The Terrys’ court date is set for tomorrow, while the Reillys are set to appear this Friday at 11am. 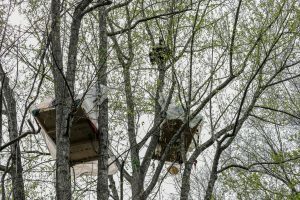 If convicted, they each could be charged with daily fines for every day they remain living in the trees. 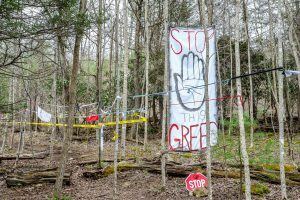 *Editors Note: Keep an eye out for RVA #33 and Madelyne Ashworth’s in-depth reporting on pipeline resistance throughout the Commonwealth. Madelyne is a Richmond native and staff writer at RVA Magazine, primarily covering politics and white nationalism in Virginia. She spent the past four years working and living in D.C., earning her B.A. in journalism and running to the White House every time the President sneezed. Follow her on Twitter at @madelyne_ash. 1 Unite the Right 2.0 Planned for Washington, D.C.